At MSI we stock a complete line of standard size companion flanges with rough bore that we machine to fit your splined & keyed shafts. We have the capability to bore and key from DIN 58mm to 390mm, and from SAE 1310 to 1950 series, as well as spline bores and cross-serrate flange faces to fit your particular application. 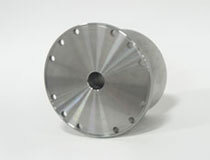 We also have machining capabilities that allow us to do special order jobs on material up to 750mm.